'Twas the week before Christmas and Hubert's has a brand new little brother! 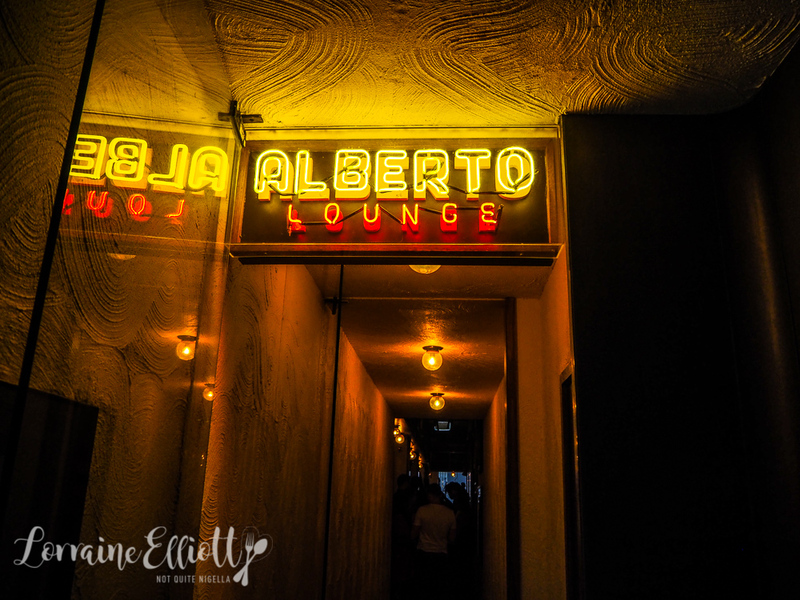 By Swillhouse Group, Alberto Lounge lies on Alberta Street near Hyde Park tucked away from the main streets. 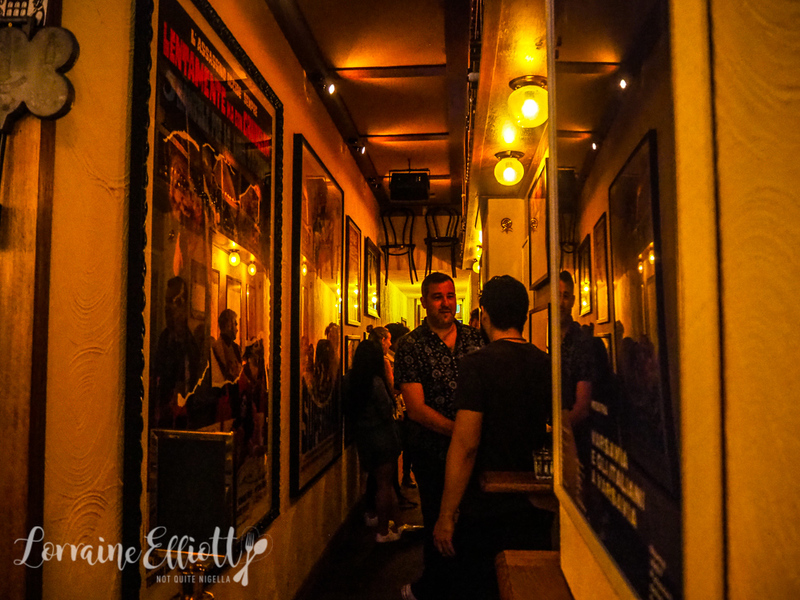 Chef Daniel Pepperell's offerings are Italian Australian with memorable versions of cacio e pepe made with the fluffiest gnocchi or a Trippa Alla Romana that will have you sweeping the plate with the bread. 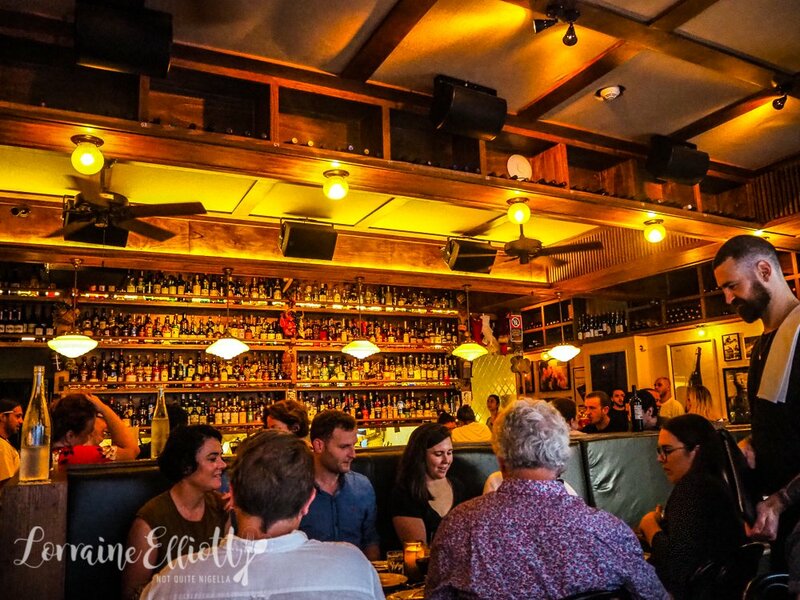 The wine bottles lining one window indicate that this is not only somewhere to eat but somewhere to drink as well with a strong Italian wine list. A message came from a lovely Instagram follower late one Sunday. "Alberto's Lounge check it out" was the simple message. That was the signal that Alberto Lounge or Alberto's was finally open just a week before Christmas. So I dragged Mr NQN, my mother and sister along. I say dragged because my mother has now decided she only likes Asian food but agreed to come along. There were things that were already on my hit list: the paccheri alla Bolognese, the tuna crudo and house made gelato. 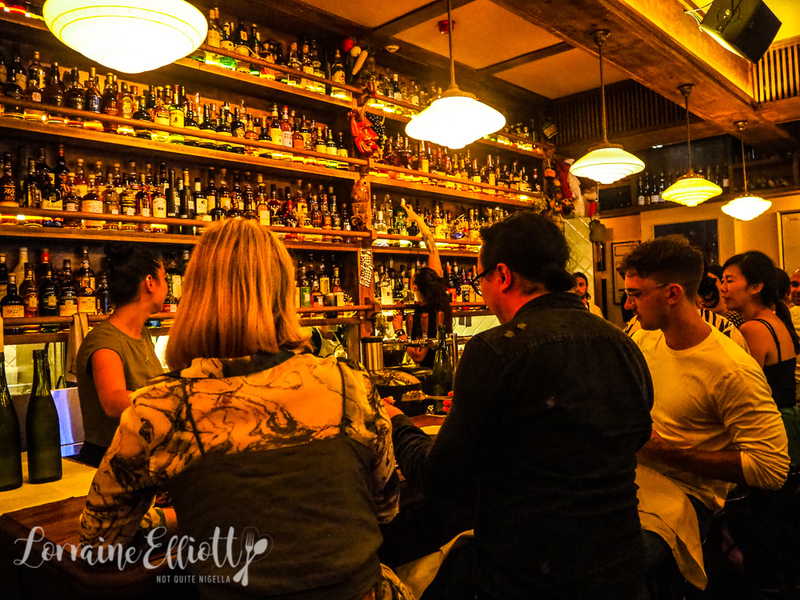 Roman food isn't that common in Sydney (Marta is one notable restaurant doing it well) and I love Roman food so the cacio e pepe, Bucatini all'Amatriciana and Trippa alla Romana are also on my list. It's early days but they do take bookings. At the moment you just email them on the email below to make one but the restaurant is primarily for walk-ins. We arrive at 5:30pm on a Monday and by the time we leave around 2 hours later the hallway has people standing down each side, some sipping drinks while waiting. 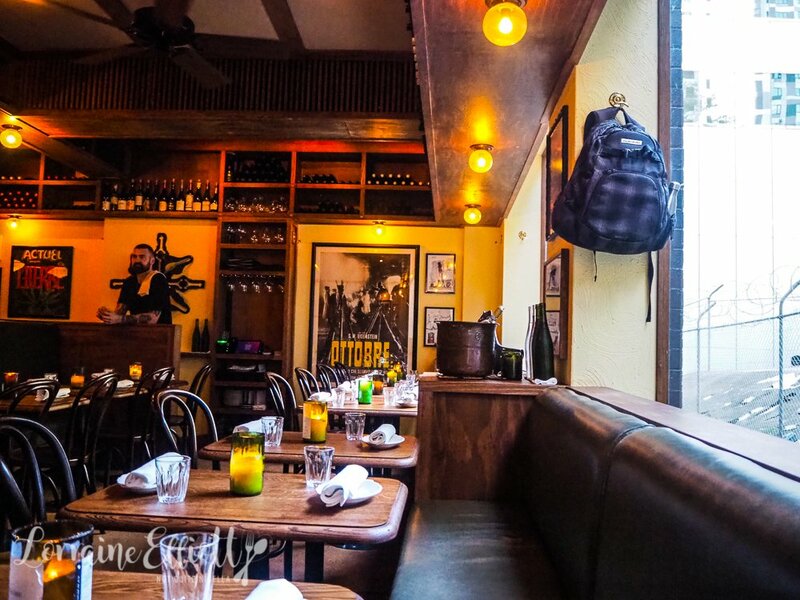 There are booths and tables near a window and we're seated in the corner. The vibe here is slightly retro chic but warm and welcoming. And even when it is really busy you can still hear each other to talk. 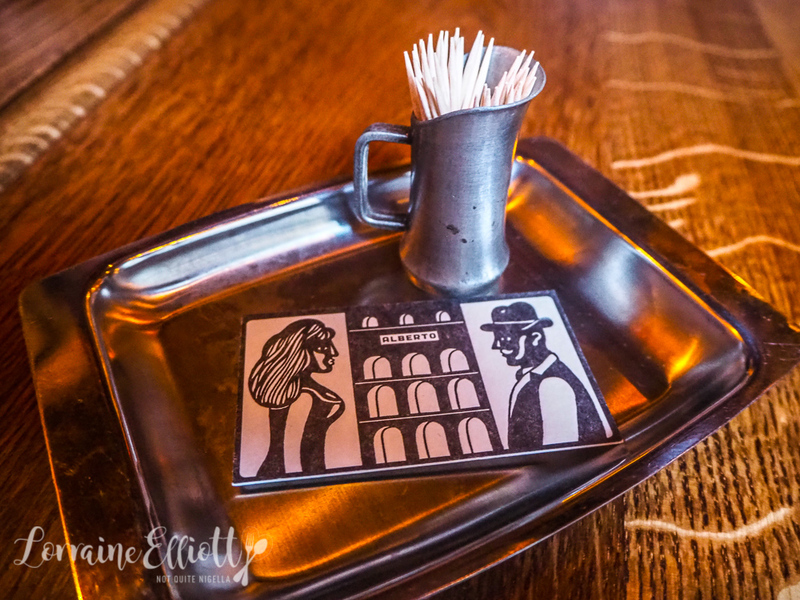 Service is very friendly and lovely and we get our orders in before everyone else does so we're not waiting long. Servings do tend to be on the small side so you may want to order at least one pasta and one starter per person. 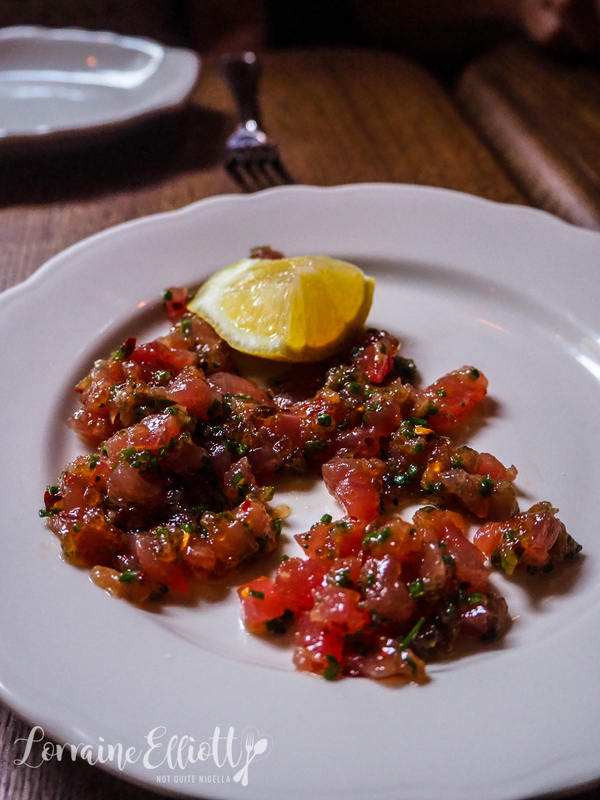 The crudo di Tonno is like a tuna version of a steak tartare with creaminess from what tastes like egg yolk, chives and a good mix of seasonings. It even coaxes my mother who avoids raw food to have seconds. 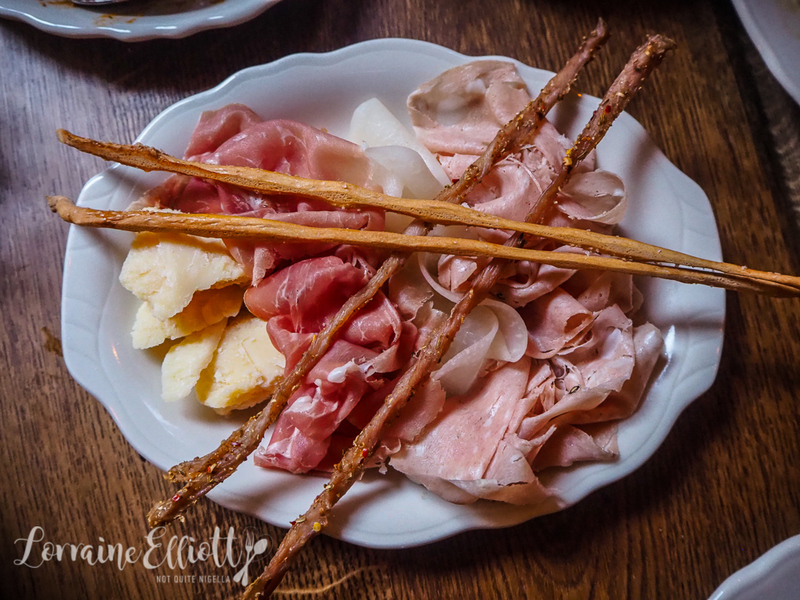 There are two types of meats: a thinly sliced mortadella from NSW and a Prosciutto di Parma with pickled, thinly sliced discs of daikon, some piave vecchio cheese that tastes like aged reggiano cheese complete with crystals. To the side are two reed thin grissini sticks as well as long twists of dried and spiced pork loin in their version of a pork jerky. I particularly love the mortadella and the cheese. If you had told me 10 years ago that I would be searching menus for trippa alla Romana I would have perhaps said you would be tripping. Because I hated tripe until I went to Rome and ate it there. And the version here is my favourite dish of the night. 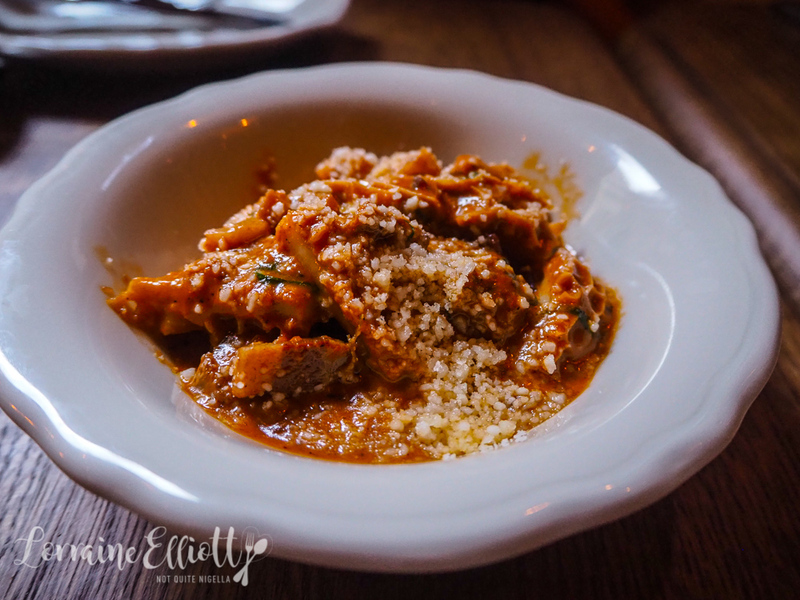 The tripe is buttery soft and melting in texture and the sauce is rich and flavoursome-even reminding me a bit of the spices used in Indian dishes like tandoori (I swear I'm not hallucinating). This is the dish and sauce that prompted us to order bread to mop it up. And the topping? It's deep fried tripe that has a similar taste and texture to pork crackling crumbs. The only downside is that it is a very small serve and sharing hurt a little bit. 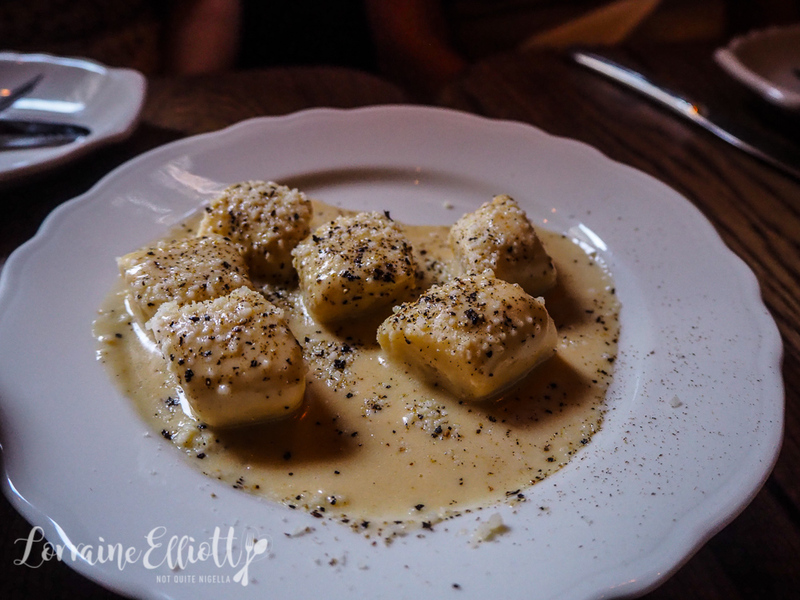 The other dish I wanted to try was the gnocchi al Cacio e Pepe or cheese and pepper gnocchi. The gnocchi are huge, fluffy, light dumplings with a creamy cheese sauce. This too needs bread to mop up the sauce. 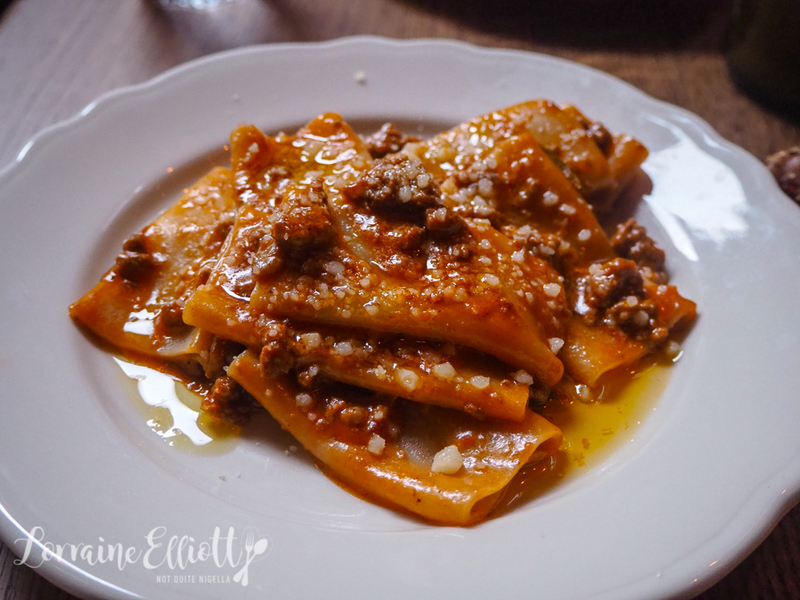 The fat tubes of paccheri pasta are served with a rich Bolognese sauce. The pasta is perfectly al dente and it's a favourite at the table for the winning toothsomeness of the pasta and sauce in combination. 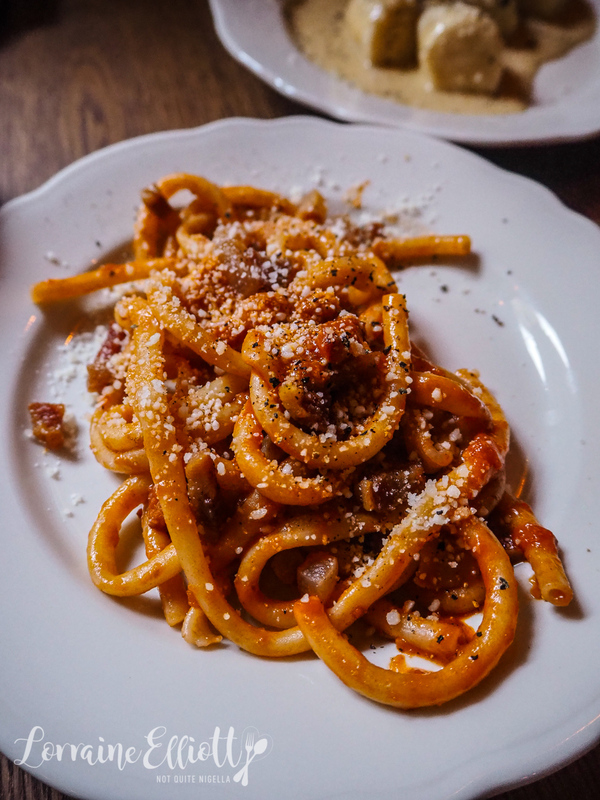 The bucatini all'Amatriciana is another Roman dish. With small chunks of fatty, delicious pork jowl and a tomato based sauce. This is tasty with a good amount of guanciale. Now I was warned against filling up on bread but we had to have it because of all of the lovely sauces. In fact this was a last minute decision once the other dishes had come out. 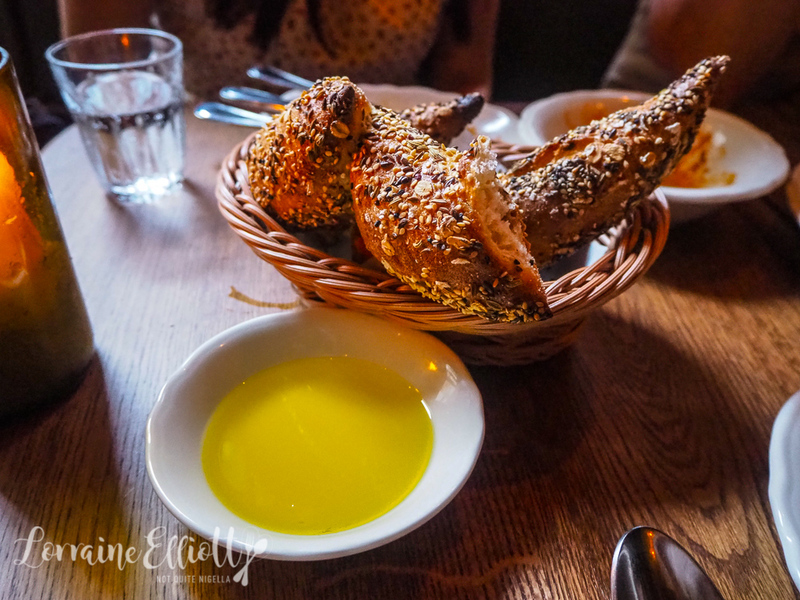 The warm seed covered Pain d'Epi comes with some olive oil. 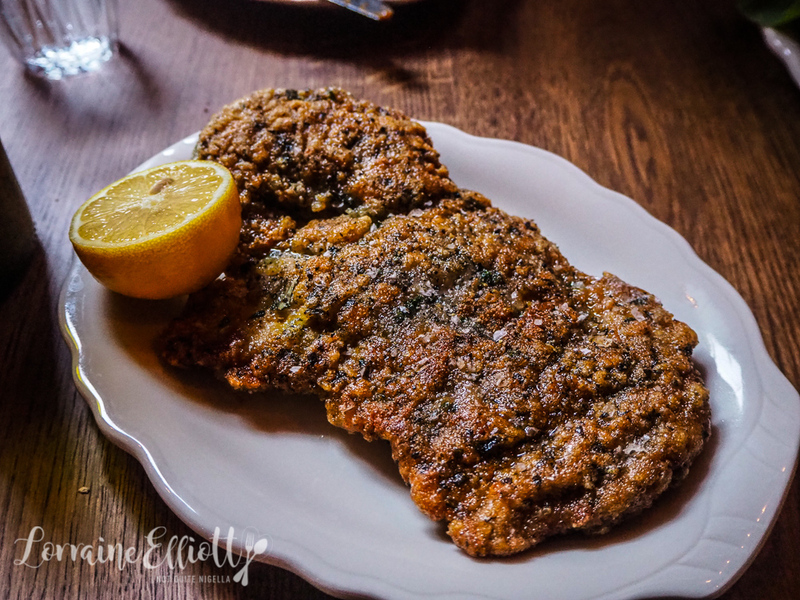 Our last savoury dish is the veal cotoletta or breaded veal cutlet. Cooked pink inside, there looks to be turmeric in the breading as well as plenty of herbs. It's juicy and tender and goes perfectly with the salad which our waiter suggested to us as a side dish. 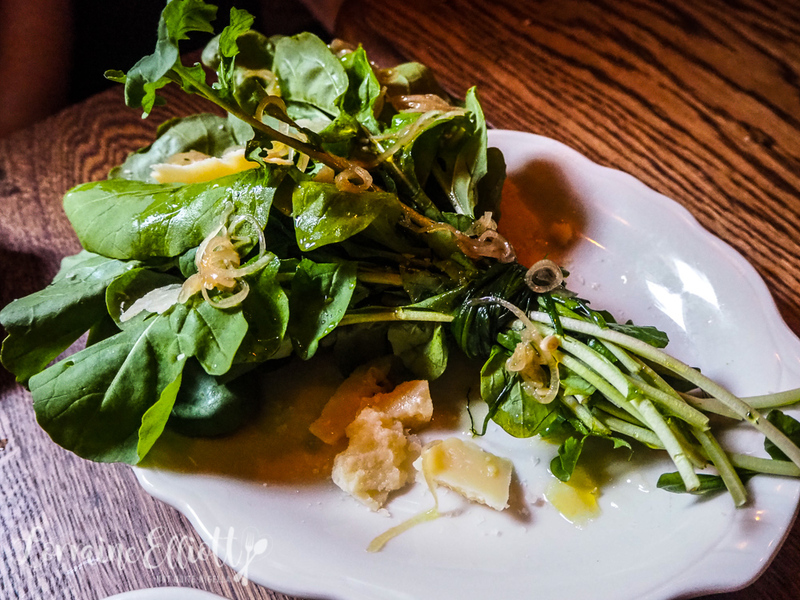 This is a bouquet of chive wrapped wild rocket leaves with pickled golden shallots and rough cheese chunks with a vinaigrette dressing. You cut the bundle of chives and divide the leaves. 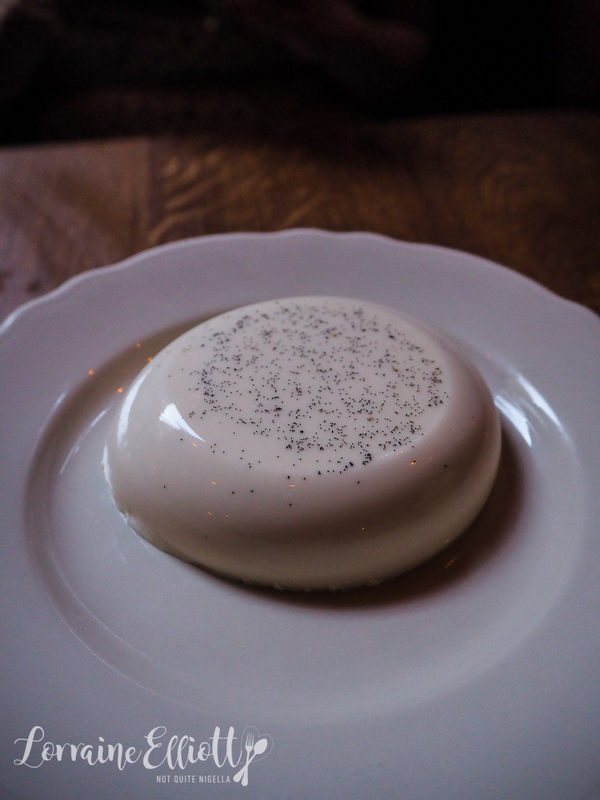 The panna cotta is wobbling and jellied and quaking on its plate as we bring it towards us respectively. The macadamia flavour is very distinct in this and our waiter explains that it is made from macadamia milk that is made fresh daily. It's lovely and simple. The cannoli filling changes regularly. 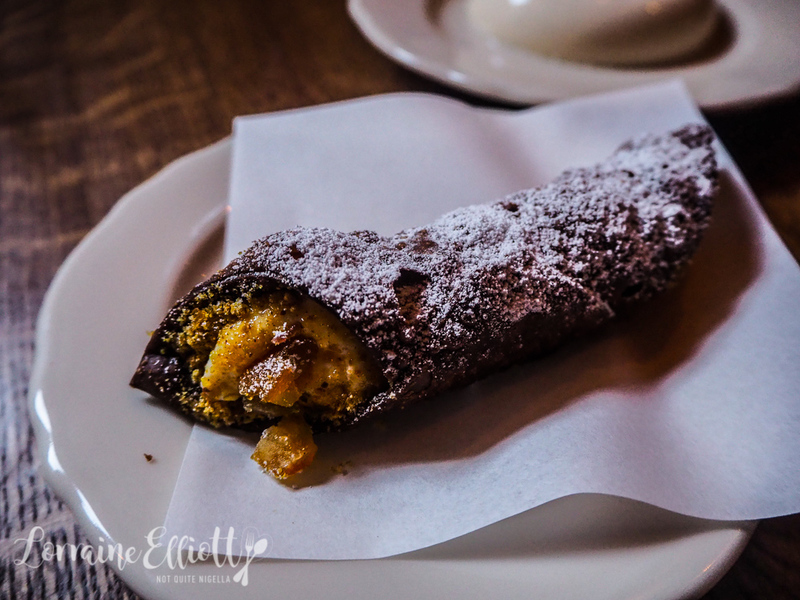 Today's cannoli tastes like a chocolate cannoli shell with a smooth ricotta filling studded with candied orange pieces. Sprinkled on top are chopped pistachios. It's crunchy on the outside and smooth and creamy on the inside. 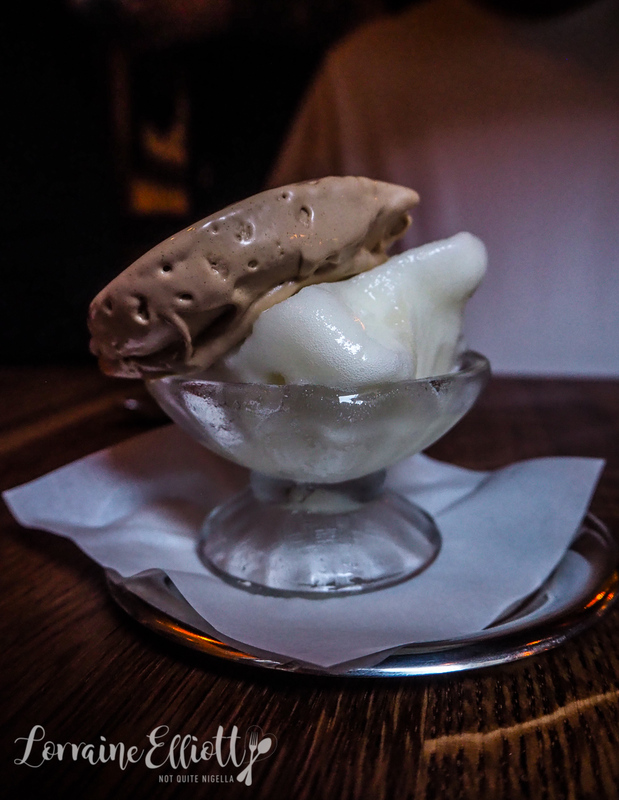 There are two flavours of gelato: hazelnut and lemon in an old fashioned ice cream coupe glass. The lemon is piquant and pucker inducing and what you'd want from a lemon gelato. The hazelnut however is something quite special. They have a gelato machine where they make all the gelato and this gelato is other worldly silky smooth. It tastes like Nutella without the intensity of the cocoa. Actually it tastes like fancy Nutella (I've had it once) more than anything. And I think I may have changed my mother's mind about the Asian food thing. So tell me Dear Reader, do you have a favourite pasta dish? Or a favourite region or city in Italy? And are you team lemon or hazelnut gelato?